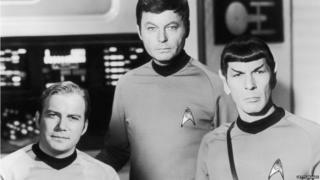 A new Star Trek television series will launch in January 2017, CBS has announced. According to the show's website, it "will introduce new characters seeking imaginative new worlds and new civilizations". The hugely successful show franchise celebrates its 50th anniversary in 2016. "There is no better time to give Star Trek fans a new series," said David Stapf, president of CBS TV studios. Alex Kurtzman, who co-wrote and produced the blockbuster films Star Trek (2009) and Star Trek Into Darkness (2013) will serve as executive producer for the series. "Everyone here has great respect for this franchise and we're excited to launch its next television chapter in the creative mind and skilled hands of Alex Kurtzman, someone who knows this world and its audience intimately," added Stapf. The series will begin with a special preview broadcast on the CBS Television Network before running exclusively on CBS All Access, the network's digital subscription video on demand and live streaming service. It is also expected to be distributed around the world by CBS Studios International. The original Star Trek spawned a dozen feature films and five television series, and is still licensed on platforms across over 190 countries. According to StarTrek.com the franchise still generates more than a billion social media impressions every month. The new series is not related to the upcoming feature film Star Trek Beyond, to be released in summer 2016.